Yesterday we had the pleasure of meeting Rob & Jo at the Geldeston Locks pub. 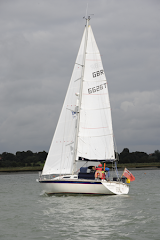 Rob owns a Storm like ours and helped us work out how to go sailing with Sam way back in 2013. He has also been a reliable source of advice, information and even help with a spanner in the subsequent years. Last time we met up was exactly two years ago in Piriac and we sailed in company with them for a while, down as far as the Île d'Yeu. Since then Sam & I have sailed about a bit in southern Brittany and got as far as Brest last summer, before giving up and getting someone else to bring the boat home. They sailed down to La Rochelle, decided Biscay was too hot, sailed home, and last year took the boat to the Baltic and got as far as Tallinn in Estonia before heading home. This year they are having a break from sailing, which is extremely understandable given the distance they covered last year. It was lovely to see them. So I am reminded that our blog is very empty this year...mainly because we haven't done much sailing. I have added an update on maintenance and backdated it to the beginning of June, mainly as a record for me. On May 18, only a couple of hours after Lindsay had serviced the engine, Guy came down to help us get the sails on... at which point we realised that they were already on. So instead we spent the time drifting gently out into the Orwell with me doing everything and Guy advising. This was practice, because on Saturday May 19, on a day of very gentle breezes, Sam and I set off on an epic voyage on our own. We sailed all the way to the Royal Harwich Yacht Club at Woolverstone, which is nearly three miles from SYH, just upriver. There we called ahead for help and around a dozen members of the Westerly Owners Association guided us into a berth alongside the jetty, and took our lines. We spent a pleasant evening with the WOA celebrating the 50th anniversary of the East Coast Group, and I discovered the showers, which I had never noticed on dozens of previous visits to RHYC by car for CA events. Then on the Sunday we sailed back to SYH, again on our own. Surprisingly there was no-one around on the pontoon, so I really did bring her in solo, fortunately with no problems at all. So, I know I can do it. Now I have to pluck up courage to go a bit further. I felt a bit frustrated about not being in France or sailing abroad this year. So in early June we drove down to Burgundy and spent a few nights in a very pleasant adapted gîte. We didn't get away from boats entirely, though: we refreshed our memories of the delightful French canals and even looked at some rather nasty motor boats in St-Jean-de-Losne, but we didn't buy any. Écluse spotted on the drive down. In 2008 we went past the end of this lock but we didn't go through it. Last weekend we finally had something like a proper sail. Guy is working again as ferry captain at Orfordness but up to this week has only been working Saturdays. We worked out that we could meet up at SYH on a Friday, sail to Orford, he could go to work on Saturday and sail home with us on the Sunday. There was only one weekend in the whole year when this would actually work out and the tides were at neaps (springs in the Ore can run at 5-6 knots). It meant missing a dinner with my dear old friends from Aviva, and missing the launch of the new Waveney Heritage Centre which I felt very bad about because I had promised my friend Tim that I would sing with him at the opening. But we did it, we went, the wind was on the nose on the way there, but with us most of the way back, and we had a really lovely outing with Guy operating our personal taxi service at Orford (although we didn't try to get Sam off the boat). Hooray!! I'm finally getting around to posting this in June – I need a record of winter activities because otherwise I forget what we had done! Kalessin came out of the water in January and had a new set of standing rigging, supplied by Evolution Rigging which has taken over from the delightful but inefficient Big Nige. I'd been considering a new engine, but realised that the rigging was last replaced in 2005/6 and because the rigging is only insured for 10 years, it was time to prioritise new bits of wire.The foil on our dear old Rotastay genoa furler was cracked, and as Rotastay went out of business some years ago, it could not be replaced. So we now have a brand new Furlex. Evolution also replaced he VHF cable and aerial – the aerial was last replaced in Spain in 2006, but the cable may be much older. VHF reception is now noticeably better. The whole lot, along with replacing the gooseneck bracket and various other bits and pieces, came to just under £4,500. Her Coppercoat, expensively applied by Suffolk Yacht Harbour in 2016, has proved less good than we hoped. After only two seasons, including one winter in fresh water in the Vilaine, it was coming off one side of the keel and the other side of the rudder. Why? SYH agreed to make good the damage. Despite the supposed 10-year warranty, SYH only guarantees Coppercoat for three years, which is disappointing. Still, we were well inside that time. Josh (who runs the yard) bithered and dithered and didn't do much until I hassled, and finally finished the repairs just before the launch so I didn't see them. Lindsay serviced the engine just before we went out for the first time. He phoned me to let me know that he is a bit worried about the age and reliability of the engine, especially if it's just Sam and me on board. I explained that I really wasn't sure if I wanted to spend £10k+ on a new engine and new prop - as the vast majority of new engines turn the other way, we'd have to replace our Darglow feathering prop. And we might end up spending more than the boat is now worth and only doing 50 hours on it. It would, however, be very nice to have slightly more than 18.5hp. He has promised to look out for a good reconditioned engine which we could fit next winter. Still, at least we are back on our wide pontoon in our old location, which is lovely. We are next to an absolutely brand new lifting-keel Jeanneau Sun Odyssey 349, which focuses the mind when coming into the berth. She's only actually a foot (30cm) longer than Kalessin, very slightly narrower beam (3.44m to our 3.5) yet somehow they squeeze in twin wheels compared with our nice old-fashioned tiller. Bizarrely the standard engine is not much more powerful than ours (21hp). I thought all new sailing boats had 50hp engines these days.